The morning after your wedding day should be relaxing and romantic. 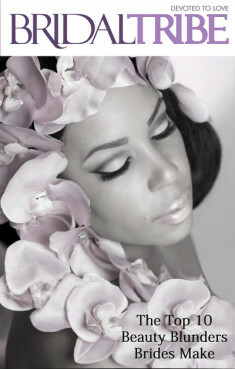 All of the hustle and bustle of your big day has come to and end and now it is time to enjoy your new married life. Nothing says romance like a romantic breakfast on the waters edge where you can enjoy each other's company while enjoying comfort food in a luxurious, peaceful outdoor setting. Whether you are describing the perfect scene to the hotel concierge, or planning to set the stage for romance yourself, here are a few simple ideas that can take your breakfast to another level. Keep the menu simple. Food doesn't have to be extravagant to be good. Keeping the menu simple can make the breakfast go smoother. We suggest not trying out new foods when romance is on the menu unless your a fairly adventurous couple. The last thing you want is for a new recipe to take a turn for the worse, and the end result of breakfast is being left with unsatisfied taste buds. Sticking with simple comfort foods like homemade waffles keeps things uncomplicated and delicious. If you want to step it up a notch, add a few slices of fresh fruit as a special way of 'upgrading' your breakfast dish. Serve juice and water from a glass pitcher, and pour it into champagne glasses for a romantic touch. Having a nearby serving table will help keep clutter on the table down to a minimum while keeping refills readily available. If you are putting the breakfast together yourself, remember to keep the coffee in a carafe so that refills will be handy and stay plenty hot. On another note, if you are the one who is serving your partner, make sure that you provide full, romantic service. This means adding sugar and cream to their coffee, refilling, pulling out their chair, etc. When it comes to decorating, event designer and planner Lenee Valentine has given us a great example of simple, yet great looking decor that will help to take the breakfast to the level of luxury that you desire. Start with a simple white satin table cloth, and drape it with a cloth that provides color and texture to the setting. Try to stick with 2 main colors, and one accent color. You can add a few seashells to the table top, and choose a simple centerpiece such as a small candelabra, or even some fresh flowers. At the foot of the centerpiece you can add some more fresh flowers, or small cuttings of local greenery, along with some white coral and a few accent sea shells. 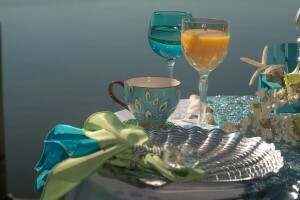 Here she used two colors for the wine glasses, both clear and aqua to carry the color throughout the setting. 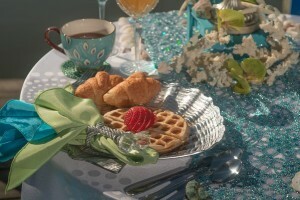 The silver tone seashell plates really add a special touch, while the peacock feathered coffee cups bring all of the colors used together in one piece. Placing the table at the end of the pier promotes a feeling of privacy, and tranquility that otherwise would not be found inside of a dining room experience. Surprising your husband or wife with such elegant design, and great comfort food on the morning after your vows is sure to have them feeling like they are treasured. Do you have a morning after breakfast experience or suggestion that you would like to share? Let us know your idea of a perfect romantic breakfast below.